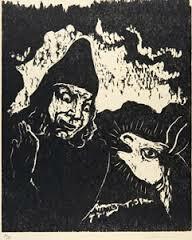 27 Balak said to Balaam, “Come on, let’s try another place. Maybe God will let you curse Israel from there.” 28 So he took Balaam to Mount Peor overlooking the desert north of the Dead Sea. 30 After Balak had done what Balaam asked, he sacrificed a bull and a ram on each altar. so listen to my message! and saw a vision of Israel. or a garden beside a river. God led you out of Egypt. Who would dare disturb you? The donkey tells Balaam a few things…. The presence of this passage in the lectionary reminds me how long it is since I read the book of Numbers. It’s not easy reading, but does contain many good stories and much genuinely ancient material. The story of Balaam, who is known in non-Israelite material from the 8th century BCE, is told in two different ways. Both start with King Balak of Moab summoning the prophet Balaam to put a curse on the people of Israel who were infiltrating his terriitory. In one version Balaam sets out quite happily to do this but is prevented by an angel who bars his way but is visible only to his donkey, who eventually speaks to Balaam and warns him of the angel’s presence. The angel tells Balaam to say only what God tells him. The other version misses out this piece of pantomime and shows Balaam as unwilling from the start to curse Israel. The king gives Balaam four chances to curse Israel and each time he blesses them.The passage above is the third blessing, which like the first two prophesies a fruitful future for Israel. For the writers of Numbers this incident served to show that israel’s success in taking over the land of Canaan was announced even by the famous heathen prophet, Balaam-with the satirical subtext that even a donkey could see that God was watching over Israel. Today we can only recognise how deeply embedded in the biblical tradition is Israel’s conviction that the “land of promise” rightly belongs to them and not to its original inhabitants who are disposable. Modern scholars have seen the story of the Exodus as a myth of liberation: God acts for the oppressed. But for the biblical tradition it is never just a story of liberation but also one of conquest, settlement and the oppression of Canaanites, backed by God. 1. We need to call things by name even when they are in the bible: this is a racist story which like large chunks of the Hebrew bible makes God into a racist God. There is another, smaller part of the Hebrew bible which is opposed to this racism and tries to tell the story of Israel in a different way,but readers should not overlook what is actually written. I remember being told in Sunday School that God punished Israel because its army did not slaughter all the men, women, children and animals of a conquered city. Would my gentle teachers get done today as hate preachers? Or do we see hate language only in the Qur’an? 2. We need to study the bible according to the best scholarly information available and by the best methods available, so that we expose the history of the text and behind the texts. This often means dismantling them in a way that fundamentalists will denounce. 3.We need to study the bible in the light of Christ, that is, by using the New Testament as a lens through which we can view the old. For example we have to read the story of God’s “choice” of Israel through the lens of the story of the multiracial, multinational assemblies of Jesus Messiah. St Paul in particular does so, without abandoning the story of a chosen people but seeing it afresh in the light of the Jewish rejection of Jesus. 4. We should be aware how a racist reading of the bible assisted and continues to assist Israel’s crimes against the Palestinians. 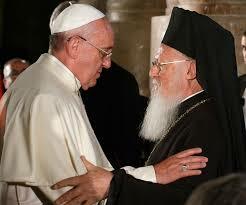 Pope & Patriarch-but is it true and just? The Pharisees refused to speak the name of God in connection with John, because they disliked the truth he announced. Jesus refused to speak the name of God in connection with his own words and actions, so that they would also have to judge his truth. He meant that theological dispute is not the point. Are the words true, are the actions just? Those are the questions. In our multifaith society this is helpful. We are not to judge the utterances of religious leaders by their supposed credentials (whether Archbishop, Evangelist, Iman or Ayatollah), but by their truth and justice.